Spent a lovely day yesterday with my girl, my hubby, my parents, my grandpa, and cousins we rarely get to see! I'm thankful that Caylee loves to run around with me. 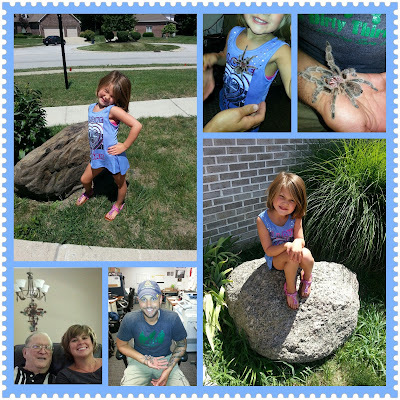 We spent the day hopping from shop to shop, enjoying each place, the lovely weather, and our time together before stopping by to see Chad and "Big Ben", the office tarantula...dun, dun, dun!!!! It got a little crazy towards the end of the visit, but all was well and it was nice to see the hubby (especially since he's been working A LOT lately)! Then it was time for dinner with my parents, grandpa, and cousins we don't get to see that often. It's always a pleasure to visit with grandpa and to share with him the exciting adventures I am taking on with Flowers on Footprints! His continued support has made so many things possible and I am very thankful for that. Jul 24 Is this REALLY happening?! ?